Paris Gare de Lyon . 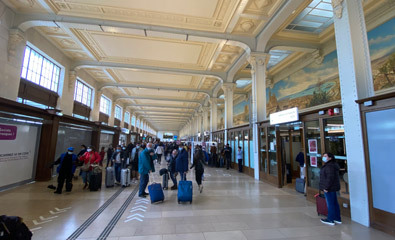 . .
One of the most important stations in Paris and the third busiest station in France, the Gare de Lyon is the station for trains heading southeast out of the city, including trains to Dijon, Lyon, Avignon, Marseille, Nice, the French Alps, Switzerland, Italy & Barcelona. There has been a station here since 1847, although the current station building dates from 1900. 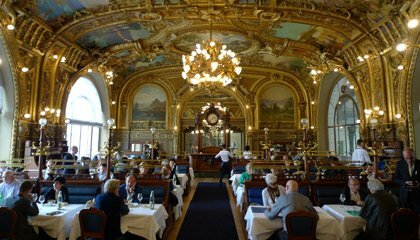 The Gare de Lyon is a classic Parisian landmark and I always relish the chance for a meal, coffee or beer at the fabled Train Bleu restaurant. The Gare de Lyon is a terminus with flat level access between the taxi rank, concourse & all platforms, so it's easy to navigate with wheeled luggage. The station has two separate concourses, known as Hall 1 and Hall 2, marked on the station plan below by the two red home logos. Hall 1 is the original trainshed dating from 1900 housing platforms A to N, Hall 2 is the later extension housing platforms 5 to 23. You can find a detailed plan of the station and its facilities at www.gares-sncf.com. The classic facade of the Gare de Lyon of 1900. The large arched windows above the canopy are those of the Train Bleu restaurant. If you walk through the entrances in this facade, you'll find yourself in Hall 1, facing platforms A to N.
Hall 1 & platforms A to N seen from the top of the Train Bleu restaurant steps. Platform A on the left, N on the right. Note the automatic ticket gates between concourse and platforms. Note the main departure boards above Starbucks in the centre. Note the escalators down to the Metro & RER Express Metro. A later extension, accessed from Hall 1 either by walking down platform A or by walking through the ticket hall. Looking northeast across Hall 2, with platforms 5 to 23 on the right. Platform A is behind the camera. The slope down on the right of this photo descends to Hall 3. Hall 3 is what they've now decided to call the sprawling underground concourse (a glorified passageway) one floor down from Hall 2 and extending underneath all the tracks. You can reach Hall 3 by going down escalators from Hall 2, or by going down stairs or escalators from Hall 1 then a short walk. There are stairs and escalators from Hall 3 up to each platform. You normally access the platforms and board trains from Hall 1 or Hall 2, but Hall 3 is used for the compulsory check-in for most Ouigo departures. The Salon Grand Voyager and left luggage lockers are in Hall 3, plus a cafe and many ticket machines. Looking along Hall 3 underneath all the tracks, platform 5 at one end, platform N at the other. The ticket hall connects Hall 1 with Hall 2, parallel with platform A. The doors to the SNCF ticket office are now on the right. Thello sleeper train ticket office... Private operator Thello has its own ticket office for its Paris-Italy sleeper train on the main concourse (Hall 1) level with platform M, marked on the station plan here. There's an SNCF Grand Voyageur first class at the Gare de Lyon, open 05:40-21:00 weekdays, 07:00-20:00 weekends, closed on French national holidays. The lounge has a water cooler and free coffee machine, free WiFi, phone chargers, toilets and lounge seating. 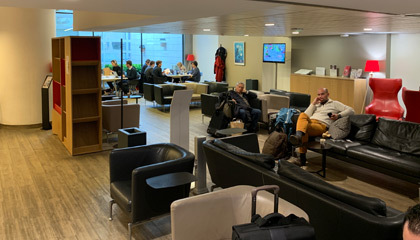 You can use the lounge if you have any sort of 1st class TGV-Lyria ticket to Switzerland, whether business premier or standard premier, full-price or discounted. But for all other routes, you can only use the lounge if either (a) you have SNCF's (or other Railteam members) frequent traveller loyalty card or a full-price 1st class Pro fare (not a discounted 1st class fare), which you probably won't have. It's located in Hall 3, one floor below platform level beneath Hall 2. It's very poorly signed, but if you go down into Hall 3 and walk to the extreme platform 5 end of Hall 3 until you can go no further, then turn right around the corner, you'll find it hidden round there. The Man in Seat 61 says, "The lounge can be handy if you qualify to enter, but personally I still prefer paying for a beer or a proper coffee at the Train Bleu restaurant's Big Ben bar!" The luggage lockers are in Hall 3, which is one floor down from track level. Follow the signs to the Consigne. They're at the extreme platform N end of Hall 3, in the far left corner as you walk along Hall 3 from platform 5 towards platform N. Expect to have your bags X-rayed at the entrance to the locker room. For opening hours & prices see the left luggage lockers page. 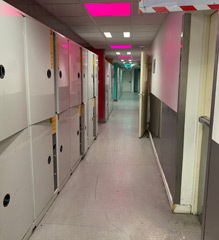 The left luggage locker room, in the corner at the platform N end of Hall 3. Take a moment to wander onto the forecourt and see the beautiful station facade of 1900 with its famous clock tower. The clock is illuminated at night - it's now electric of course, but before 1929 this was done with oil lamps. Trains typically become ready for boarding around 20 minutes before departure, when a platform number will appear against your train on the various departure screens around the station. However, the screens will show whether to wait in Hall 1 or Hall 2 even before a specific platform number is shown. It only takes 2 minutes to walk between Hall 1 & Hall 2 along platform A or through the ticket hall, but it's better to be waiting in the right area close to where your train will leave. Most platforms at the Gare de Lyon now have automatic ticket gates. 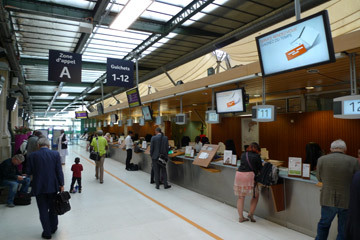 When each train is ready for boarding, place the barcode on your print-your-own ticket, conventional ticket or smartphone against the glass scanner on the gate, and the gate will open. There are plenty of staff to help if you need assistance. If you have ticket barcodes for multiple people on your smartphone, use one at a time to send your travel companions through the gates, then use the last one to get yourself through. The Big Ben bar - the ideal VIP waiting lounge! 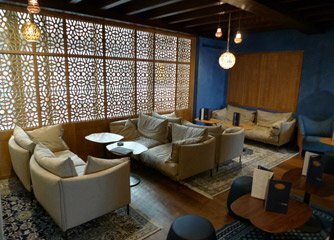 For the price of a cup of coffee or a beer and maybe some tapas, you can use the Big Ben Bar inside the Train Bleu Restaurant as your quiet & peaceful VIP waiting lounge, away from the hubbub of the station concourse below - see the Big Ben Bar photos & info here. It has great character and is a favourite of mine, it's not the cheapest beer or coffee you'll find just consider it VIP lounge access! 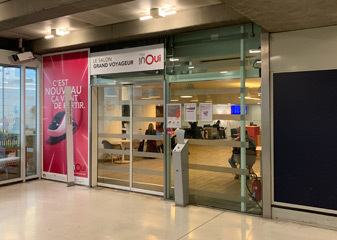 There's an SNCF Grand Voyageur lounge at the Gare de Lyon for certain types of first class ticket holders, see details of facilities, location & access conditions below. Though personally I still prefer paying for a beer or a proper coffee at the Train Bleu restaurant's Big Ben bar! There is a Monoprix supermarket a few metres up the Rue de Lyon opposite the station, I've marked it on the map above - just click for full screen then zoom out. the supermarket is a good place to stock up for a journey, and has a passable range of half-bottles of wine, ideal for taking with you on a train. Of course there are coffee and filled baguette outlets all over the station, and you'll also find a chemists on the station, in the ticket hall passageway towards Hall 2. The station has plenty of luggage lockers if you want to leave your bags for a few hours or a day, see the luggage lockers section below. The luggage lockers are in Hall 3 (one floor down from platform level) at the extreme platform N end of that Hall, in the extreme far left corner of Hall 3 as you walk along Hall 3 from platform 5 towards platform N. Follow the signs to the Consigne. Expect to have your bags X-rayed at the entrance to the locker room. There's a well-organised taxi rank on the station forecourt in front of the station, with staff allocating people to taxis. Even if the queue looks long, it moves fast and it won't take much more than 10 minutes to get into a taxi. It's a 25-30 minute drive to the Gare du Nord or Gare de l'Est. ...the 4-star Mercure Paris Gare de Lyon is on the station forecourt itself right next to the clock tower, the 3-star Hotel Terminus Lyon is right in front of the station, the Novotel Paris Gare de Lyon is opposite the station. Or try the Mistral Hotel 800m from Gare de Lyon, or the 2-star Hotel de Reims 5 minutes walk from Gare de Lyon. For more detailed information on the station & its facilities see the official SNCF site www.gares-sncf.com. A haven! The Big Ben Bar. More info here. A treat! Lunch at the Train Bleu restaurant. More info here.